Cast Iron vs. Baking Stone? I finally figured out how to make basic sandwich bread and now I'm moving on to greater challenges. I would like to get a baking stone but there seems to be a number of people who prefer cast iron. I am already a huge fan of cast iron. I have several cast iron pieces already and enjoy theire durability and versatility. I cook at home with them. I use them on my grill. I've used them at the park on huge out door grills for big events. I've even hiked cross country and used cast iron over the fire. So, baking stone or cast iron griddle? I believe the cast iron will be more versatile and offer many more options in use. However, I wonder if cast iron can match or exceed the baking stone's bread capabilities? In my hands, baking stones are at constant risk for breakage. I stopped buying them after the third cracked. I'm not an inexperienced baker at all, but my luck with the things just wasn't good. I moved to 6" X 6" unglazed quarry tiles. They work just as well for me as the baking stones did. If they break the negligible cost was not the annoyance it was for the larger stones. I got my tiles at one of those immense hardware stores. I don't know how to make a baguette in cast iron. Not too sure about pizza either. You probably will want both cast iron and a good stone. I have a Fibrament stone and really like it. I had cheap, thin stones that broke and also used quarry tiles. The Fibrament is much better IMHO and I haven't heard of any breakage problems. Type fibrament into the search box and you find a lot said about it. I have a 15x20" Fibrament stone as well and I love it. I use it plus my roasting pan for a la cloche. Both are good tools but like any tool, it can be for specific needs. I bought an old baking stone (50 cents at a rummage sale) and it has been behaving pretty well. It is dark and ugly but really seems to retain the heat well.I also find them at a local resale shop on occasion for a few dollars. If I needed to do rolls or baguette, I would use a rectangular baking stone. I keep the baking stone in the oven for heat retention and put my loaf pans on it. Seems to work great. I love cast iron-I have a lot of it! It is very versatile and works great for bread! If I was doing a boule,pizza or a no knead I would use the cast iron of the appropriate shape and size. I even bought a cast iron loaf pan to try. So see what works for you and always check the cupboard before spending money on an expensive , single use pan. Check the resale shops, also. 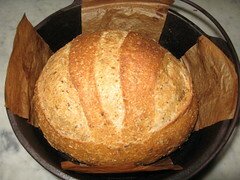 In addition, many here bake loaves in a covered cast iron dutch oven. If you don't have a dutch oven, you could try using a large (#8 or larger) cast iron frying pan if you have a stainless steel bowl that will fit snugly inside the pan (upside down). Whether using a dutch oven or a bowl, the idea is that the bread is covered for the first 15 - 20 minutes of the bake in order to trap escaping steam to facilitate oven spring, then uncovered for the rest of the bake. If you use the search box on TFL and search on cast iron, you will find a wealth of information on the topic. Ok, after much research and back and forth between cast iron and baking stones, I decided to try the cast iron. The deciding factor being that no one complained about cast iron shattering on them. Quite a few had given up on baking stones after having replaced two or three. So, I bought a LodgePro 20x10 reversible Grill/Griddle. 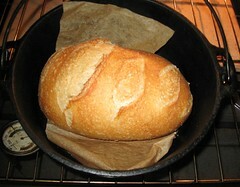 Here's a pic of the first batch of bread I've made on cast iron. Bottom left was done in my dutch oven. The others were made on the griddle. The bread recipe used is the Buttermilk and Honey Whole Wheat Sandwich Bread recipe out of TFL Handbook. I used a egg yolk wash which probably could have been applied better on the sides but looks good otherwise. For steam, well it was near dinner time and I only have one oven, I used a Venison Daube. As for shaping, this was my first time outside of a loaf pan. I tried for a dutch oven cluster (its not all there, over dinner the family had to mop up some gravy from the daube), a round, an oval and two hoagie rolls. I played around with slicing them but I need a razor blade, steak knives are too dull. The odd twist in the upper left is the remains of two baguettes I couldn't get to work. 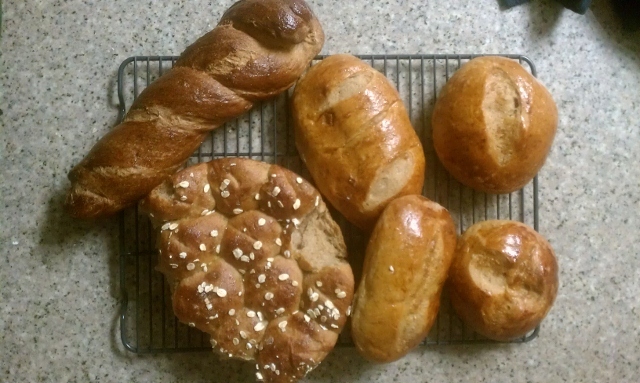 So, I braided them and then forget them in the oven. Well, that was fun and thank each and everyone one of for your help and wisdom. I don't think I'll go for the baking stones anytime soon. The cast iron performed great and I'm not sure I would have been able to tast the difference.